283-284 Abdel Moneim Riyad St. While the pulsing neon lights and energetic pace of the capital provide an atmosphere that cultivates adventure, the arid winds and dense smog easily extinguish the verve of even the most zealous city dweller. The healthy balance of mind, body and spirit is an integral aspect to surviving Cairo and there's no better way than pampering the barrier that protects you from the harsh elements of the city. Skin Säde is a Finnish skin clinic that promotes natural and non-invasive treatments and facials that diagnose and provide skin with exactly what it needs. This attitude is what differentiates Skin Säde from other dermatology centers in the city. Located in the El Motameyaz District of 6th of October City, Skin Säde operates from a large villa shared with a dental clinic. After reserving over the phone, we walked into the beautifully decorated reception area and were immediately greeted by our selected clinician. 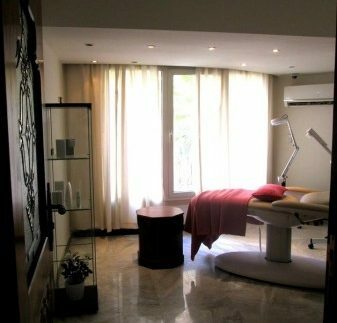 The clinic has a framed 'menu' with all the provided facials from the Classic Facial Massage (100LE) to the more inclusive Lift BTX Facial (500LE). We were then led inside to the treatment room and given a general medical sheet to fill out and then told to remove any jewelry and loose clothing. We were left for a few minutes to soak up the relaxing atmosphere and soothing music. In addition to the warm environment, the tools and machines were impeccably organised and were either completely sterilised or used disposable parts. After getting comfortable in the plushy chair, our therapist began the Hydrating Facial (450LE) by first cleansing and removing make-up with a cleansing milk, then followed by a toning gel. The products used are all of the same line by renowned brand, Oxynergy Paris. After the cleansing process, our therapist began inspecting our skin under a light to assess the type and the following procedures required. Determining that our skin type was 'oily' and identifying the areas that need extraction, our therapist prepared a chemical peel with the active ingredients of salicylic and glycolic acid. She explained the difference between chemical and enzyme peels and how each is appropriate for a specific skin type. Talking us through each step, she assured us that the peel will cause a slight tingling and heat sensation that is completely normal and is no cause for alarm. After a few minutes, the peel was removed and the steaming process began. Used to open pores to prep the skin for the extraction process, the steam was kept at a comfortable distance and allowed for normal breathing. Including ozone in the steam, we were told that it would disinfect and soothe our skin after the chemical peel. When our pores were sufficiently opened, the extraction process commenced. Gentle and entirely delicate, our therapist expertly tended to our problem areas with extreme tact and dexterity. To close our pores after the extraction, a frequency machine was used. Completely painless and rather relaxing, the nozzle was made of a felt material and was used on the entire face. After the frequency machine, a serum was applied and a galvanic machine was used to aid the skin to completely absorb the serum. The final treatment was a luxurious shoulder massage using essential oils and a face massage using a collagen pack and, as our appointment was in the evening, a night cream. Comprehensive and professional, Skin Säde employs the most experienced skin therapists that we have personally encountered in the skin care industry. With reasonable prices and amazing packages, Skin Säde has a reputation built on honesty and professionalism. For more information on the treatments, call 01208442292. Skin Säde has policies and therapists that are without a doubt some of the best in the city. The secluded location of the clinic makes it rather difficult to find for those not familiar with 6th of October City.